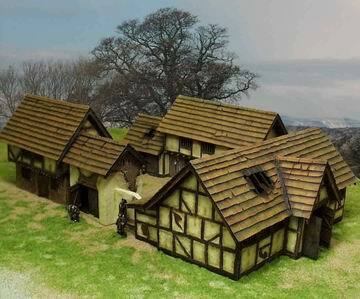 The Farmhouse come with the following modules: The Barn: Measures 5” wide by 11 ¼” long. Double doors swing open and closed on front and back of barn. Back side has attached shed that also has moving doors. Both rooms have a removable roof. Detail is phenomenal! The Gatehouse: The detailed building has pass through double doors front and back. There is also a swinging gate in the wall and the roof is removable. Comes with an L shaped section of wall that can be used in multiple configurations. Additional shipping will apply to non-US addresses. The Cottage: Measures 4” by 5 ¾” and is a two story building. Swinging doors front and back with five detailed windows. Tudor style over-hang on second story. Roof removes to allow easy access to the inside. The Stable: Measures 4” wide by 12” long. Main building has two swinging single doors on the front. Right side has exterior stairs that lead to a second story where there is functional door. Left side has large double doors for maybe a smithy or tack room. Removable roof too.